Opt for modern dwarf varieties when buying free­standing tree fruits. Pit plant all fruits as described for ornamental trees, shrubs and climbers. Take out a trench about the depth of a spade and 45 cm (18 in) wide. Fork in a generous layer of well rotted manure or garden compost into the bottom. Replace the topsoil, breaking it down in the process. Erect supports: hammer home a 2 m (7 ft) post at either end of the row. Make it at 3 m (10 ft) intervals in the case of a long row. Fix two wires to the posts to run along the length of the row, at 90 cm (3 ft) and 1.5 m (5 ft) above the ground respectively. The rasp canes are tied into the wires as they grow. Rake in a handful of general fertilizer per m (yd) run of trench, and take out trowel holes deep enough and wide enough to take the rasp canes. These are usually planted at 40—60 cm (16—24 in) apart, depending on variety. After planting, firm by treading close into the stem. And cut back top growth to 25 cm (10 in). Prepare the ground as for short-stay bedding plants. Trowel plant and plant firmly, spacing plants about 45 cm (18 in) apart with 75 cm (30 in) between rows, and ending up with the top of the rootball level with the surrounding soil. Plant in late summer. 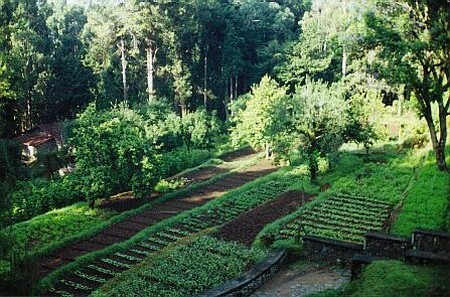 It is important not to plant the same type of vegetable crop on the same piece of land more than one year in three. To do so is to risk a build up of pests and diseases. Take out 15 cm (6 in) deep flat-bottomed drills on land that has been previously dug, manured and well cultivated. Allow about 60 cm (24 in) between rows. Apply fertilizer into the bottom of the drills at the rate of a small handful per m (yd) run. Set the potatoes about 30 cm (12 in) apart for early varieties; set maincrop varieties slightly wider apart, and always with their ‘eyes’ or shoots uppermost. Return the soil, breaking it up finely and forming a slight ridge. Do not firm. The earliest varieties are planted during early spring in mild areas and in mid-spring in cold districts. Maincrop varieties are planted about a fortnight later. Indoor raised plants are hardened off and planted out in early summer. Prepare and fertilize the trench as for raspberry canes, but make it 60 cm (24 in) wide. Runner beans are usually planted out in a double row with 45 cm (18 in) between the two rows and 30 cm (12 in) between plants within the rows. Erect supports prior to planting. Runner beans are usually trained up pairs of bean poles. 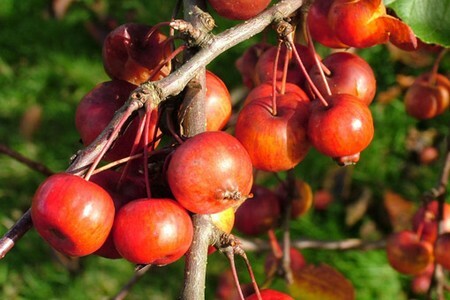 These are crossed and tied together about 15 cm (6 in) from the top, with their bottoms pushed firmly into the ground to coincide with the proposed plant spacings. One plant is set at the base of each pole. To give stability, tie a final pole horizontally along the top. Trowel plant, ensuring that the roots are comfortably spread before backfilling. Plant on land which has previously been dug deeply, manured well and limed. Rake in a handful of general fertilizer per sq m (yd) prior to planting, and firm the soil by treading. These crops need a firm, well settled bed. Trowel plant firmly, as deep as the first seed leaves. Space plants 60—75 cm (24—30 in) apart both ways, depending on variety. Prepare the ground as for brassicas. Lettuce too like well limed soil. Set the plants 25—30 cm (10—12 in) apart, depending on variety. Trowel plant reasonably firmly, but not as firmly as the brassicas. These are tender plants, needing a favoured, warm, sheltered spot and soil of above average fertility. Therefore it is recommended to plant tomatoes in containers of potting compost, as described for trees and shrubs. And give them priority for a sunny, sheltered spot on the patio. Standard varieties will need a cane for support. The other alternative is to plant in growbags. Ensure plenty of drainage slits in the base and support with proprietary plant frame supports. Leeks are usually planted early to mid-summer. Prepare the ground and fertilize as for annual short-stay plants. Take out a shallow trench with a draw hoe. Trim the top quarter of the leaves off the leek plants. Make dibber holes about 15-25 cm (6 – 10 in) apart along the bottom of the trench. Drop the plants in as deep as the base of their leaves. Water in but do not firm. Leave it to rain, and for irrigation water gradually to wash down the soil. Prepare the ground, lime and firm as for the brassicas. Trowel plant onion sets firmly, 20 cm (8in) apart both ways; allow half as much again for the shallots. Bury both shallots and onion sets so that their tops are just showing, otherwise they will almost certainly be uprooted by birds. Early to mid-spring is the average planting time. Choosing a warm, sheltered spot, dig out a 60 cm (2 ft) square pocket. Make it to the depth of a spade and set the soil to one side. Fork two or three bucketsful of well rotted compost or manure into the bottom of the excavated pocket. Scatter over a very small handful of general fertilizer. Return the topsoil, breaking it up in the process and forming a raised bed. Rake in another very small handful of general fertilizer. Trowel plant one plant per mound after all danger of frost has passed in early summer. Don’t lime any one particular piece of ground in the vegetable garden more than one year in three.